Beach Book Mart in Atlantic Beach NC, an amazing selection of comics in this bookstore on the OBX. I LOVE MY COMIC BOOK STORE!!!!!!!!!! @JakeN7 I miss The Comic Stop in Lynnwood, but my all time favorite shop in the PNW was Golden Age Collectables (even though it tends to be bursting with tourists because of the location). Is this Forbidden Planet in Newcastle? My favorite resource for all my comics and graphic novels that I buy and enjoy reading is eXpertComics: www.expertcomics.com/. I suggest you guys to take a look on their website, I always have a great experience with my shipping and stuff. I would have loved to show you pictures, but I always buy my comics on the internet, so at least I am showing you guys a good website. I hope you guys will enjoy it as much as I do ! @nerdork: Awesome pictures. Always cool to see the cosplayers too. I love this thread and have gotten much more out of it than I thought possible. Me and the Mrs. have actually talked about doing a road trip vacation someday where we stop at some of the interesting stores we've seen posted here. As always Thank You everyone who has participated in this thread. Flying Colors Comics and other cool stuff. Bay Area CA. Concord to be exact. Its a great great shop. This is Dave's Comics in Brighton, England. I love it there and the staff are just the nicest guys ever. I never really hard a local comic store the nearest one was a 20 minute train ride away. I don't think it really matters if you have a 'local' store, I go to the same store as @callsignneptune up there and it takes around an hour to get there. @callsignneptune: Nice. I like that the Blacksad HC is right in the front window. So I have a pic of my comic store(Tazmanian Comic Connection in Vancouver BC! ), but I also film my comic show at so I'll post the one pic I have on hand and the X-Mas Commercial we filmed for em! @logy5000: For real, it's so orderly and clean and...joy. @Captain_Yesterday: No way! I love Dreamland, I used to go there all the time back in early college. Awesome discounts on the graphic novels. @guardiandevil: Yea it's a nice little shop. Good people. When I was a kid they had a second one right near my house where I spend all my money on Magic cards. Damn! You people got some awesome shops you go to! Mine is pretty decent. Imagine a small brick rectangle that is half comics and half coin and jewlery pawn shop, that's Collector's Palace! Haha...it's not that bad, but compared to many of the pictures on this thread it looks like some guy's basement. The guys there are nice, but only one of them really knows anything about comics. I never really see more than one person there for comics as the jewelry shop seems to be their big draw. I've talked to a few other comic buyers who go there, but I rarely run into them. It's the closest one to me, though there are a few 30+ minutes away I'd like to check out, but this one does me just fine! Here's the best two images of it found online! Can't upload the images myself at work. @kartron: Where is that Plano shop? I live near Allen tx. 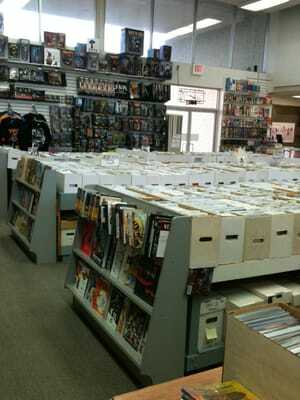 The place I go to is New England Comics in Brockton Ma. Forgot about this thread. :-( Thanks for posting. 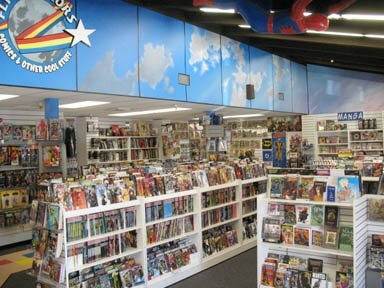 Richard's Comics and Collectables in Greenville, South Carolina. It's good to see Richard's Comics and Collectables represented on this thread, and it's especially nice to see them mentioned so early in the thread. For the mystic minded and insanely curious among you, here's a couple of handy links, one to the store's website and the other to the store's Facebook page. I only visit the store very infrequently, bordering on the rare. It is better men and women than I, that keep Richard in business. Thank God for them! I am no fan of the store front. It's definitely got a better - and more believable - disguise than Clark Kent. Fortunately, they've got a Bat Signal in the window, beckoning unto comic book passers-by. And that sign - oh, that main sign that looms over the store from above. It's legible. I'll give it that. But, it's just too small, and lacks imagination. Of course, signs don't come cheap, these days. They remind me a lot of comic books, in that regard. But, hey! At least the sign is there. At least Richard keeps flying the colors of Comicdom. Just be careful not to miss it, if you drive by. While I'm playing the role of the villain, and critiquing a few things that I don't like about the store, let's take those powers of criticism inside. That's right! Right past that plain Jane front door, into the inner sanctum of The Richard, himself. It's just so small inside. Or maybe it just seems that way to me. There's just soooOOOOooo much stuff inside, that it really just cries out in collective screams for more space to manifest itself in. Through his manipulation of the mystical arts, Richard has apparently managed to contain an explosion of interesting stuff in an artificial shell that is coincidentally just exactly the same amount of space as the inside of this store. It's strange. It's bizarre. It's inexplicable. But, by God, he's done it! It really is a wonderful little place. I wish that it were a little more brightly lit, but it's not dark, if that's a concern. It's not a place of gloom. The staff isn't populated by freaks straight out of some second-tier rogue's gallery. They've always let me browse to my heart's content. I always feel a little guilty when I leave without buying something - which, thus far, has been always. It's fortunate for me that it's about a twenty minute drive to get there. Even now, I hear it calling to me. It's located inside the city limits of the City of Greenville, South Carolina, for those souls who like to wander. That city can always certainly stand to have a few more superheroes. That's for sure! But, then again, what city couldn't? @answerman: Great looking shop mate. Cool to see some more photos and shops mentioned. Thanks for the contribution to the thread everyone. Great comic store in NY. I live in a small town and I dont think a comic book shop ever existed here. Come to think of it, we got about 20 in this country and they mostly contain 30 year old The Phantom, Donald Duck and Beetle Baily comics anyway. Sad really..
Nice seeing all these wonderful comic shops! But even though I've been buying from them for more than a year now, (they opened just in 2011) I've never actually been to their store! It's because I live on a separate island around 300 miles away, so I've had my comics shipped to me from them. Thankfully, they have an online service. And they give free shipping! How awesome is that? Plus, they hold events! Homegrown artists like Dexter Soy, Mico Suayan, and Leinil Yu show up a lot for signings. Dexter Soy signing! Photo from The Fanboy SEO, not me! Spider Man cosplayer! Photo comes from The Fanboy SEO once again. There you have it! I plan to visit their actual store someday! I did not take any of these photos and I do not claim any ownership at all of them. Close Encounters... Made better by the fact Alan Moore is always in there. @queso6p4: haha yes but insightful at the same time. @general_disarray: Heh. True. Also, is your name a South Park reference? My best friend is a big Butters fan. This thread makes me want to go to East LA and take photos of my comic book shop. This is in fact MY comic shop, Those in the Westchester NY area, STOP IN AND SAY HELLOOOOOOO!! @judgedreadlocks: This place looks cozy and inviting. @Queso6p4 it most certainly is! @judgedreadlocks: Glad to hear it! It almost looks like a cafe.